Actor Jensen Ackles, who plays Dean Winchester on the hit CW Network action series Supernatural, is a Pisces. Pisces is a zodiac sign that is symbolized by two fish swimming side by side, but in opposite directions, which signify that, Pisces people can have duel natures such as having both a pragmatic and a dreamer side to them. I don’t know if that describes Jensen Ackles personally, but I do know that he has had some interesting opportunities to delve into duality in his years on Supernatural. It started in season 3 when he got his first opportunity to work with himself as an actor in a short, but pivotal scene in S3.10, Dream A Little Dream of Me. 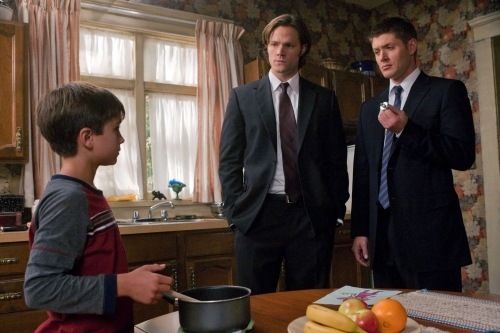 Then in S5.4 The End, Ackles spent the majority of the episode working opposite himself as an actor when he played both the present day and future incarnations of Dean Winchester. In tonight’s brand new episode of Supernatural season 6 Weekend At Bobby’s, Jensen Ackles gets to take on the newest duality in his career: being behind the camera as his director self directing his actor self who will be in front of the camera. Jensen Ackles has stated in past interviews that he is fascinated by working with cameras. He has expressed that he has a love for photography, a hobby he is adept enough at that he impressed a group of Japanese photographers doing a photo shoot with him in Japan in 2007. The actor worked with them both in front and behind the cameras to set up some very artistic and unique photographs to accompany a magazine interview with him. During rounds of interviews he did for his lead role as Tom Hanniger in the 2009 horror movie, My Bloody Valentine: 3D, Ackles stated that one of the main reasons for wanting to work on the movie was so that he could have a chance to work with and see the new ‘Real D’ 3D camera technology in action. Given all of this, it’s certainly no surprise that eventually Jensen Ackles would be taking his love of working with cameras and exploring their technology into a brand new direction as he steps behind the ones he’s been in front of for six years on Supernatural to take on directorial duties. 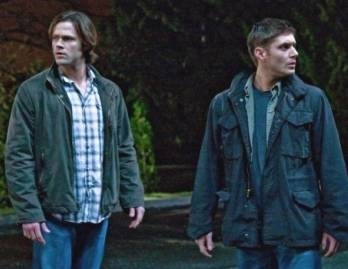 Before we go into why I think continuity is a good thing in last week’s episode of the hit CW Network series Supernatural, let’s take a look at a little continuity in real life involving Supernatural fandom. We all know that Jared Padalecki and Jensen Ackles are the two hot lead actors who play Sam and Dean Winchester on Supernatural. We know that fans are always looking for opportunities to talk to and interact with the guys and they keep hoping that one of the plethora of social networking sites that pop up under the actor’s names really does belong to them. This usually prompts one or both of the actors to make statements at conventions that they do not have Myspace, Facebook or Twitter accounts. Their friends and co-workers who do have these kinds of accounts have repeatedly stated that the guys do not have them. The continuity of this denial has never been broken and, unfortunately the fakes also continue to pop up and one in particular on Twitter became more than just an annoyance. This prompted Clif Kosterman, the bodyguard for Ackles and Padalecki to join twitter in an attempt to oust the fakers. It has also prompted the two Supernatural leads to make a video stating once more that they do not have any social networking sites and asking fans to not be fooled by imposters. Yes we start off with the usual drill, but have to say there is not a whole lot of big things going on around the fandom to talk about this time around. So I’ll focus a bit on some follow up on some things brought up in last week’s recap. Last week I mentioned that a statement was put out by a reliable source, One Tree Hill actress Danneel Harris, that neither Jensen Ackles nor Jared Padalecki has twitter accounts. I guess the memo didn’t reach whoever is attempting to impersonate Jared Padalecki on Twitter. However @PadaleckiJared was supremely outed when on Saturday, October 13th they posted a twitter saying that they had to ‘take care of a problem at the studio’. Now normally this might sound just legit enough to fool the unsuspecting fan who wants to believe that this is the real Jared Padalecki, but for one thing. Supernatural fans knew what the faker obviously didn’t, that the studio in Canada was closed that weekend due to the Canadian Thanksgiving Holiday and that the real Jared Padalecki was photographed in the Vancouver airport on that Saturday getting ready to catch a flight out to enjoy his time off. The imposter hasn’t yet been back to post to their twitter account since being massively outed by those who don’t take kindly to seeing others being tricked by a faker. The petition to get more promotion for Supernatural that was mentioned last week is still going strong over at Supernatural-web, but that is an issue in itself that I could devote an entire article to addressing. Speaking of petitions, over on Facebook some fans have started a petition to get Clif Kosterman to be considered as a guest for upcoming Supernatural conventions after Clif jokingly mentioned that he guessed there wasn’t any room on a convention guest list for him as he never seemed to get invited. As mentioned in last week’s recap, Clif played the role of the prisoner Tiny in the S2.19 episode Folsom Prison Blues and has since become bodyguard for series leads Jensen Ackles and Jared Padalecki. I would love to see Clif be a guest at conventions but I have one really important question to put forth about that: If Clif attends a convention as a headlining guest, does that mean that Ackles and Padalecki would come along to be his bodyguards? I mean after all turn about is fair play right? Ok guess not.